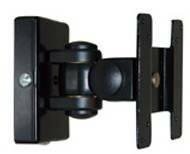 This heavy-duty wall articulating LCD Mount bracket, comes with all the necessary hardware, including special wall anchors, a level and an oversized Allen wrench for torque adjustment. When used straight, the flat screen's rear cover will be 5.25" from the wall. 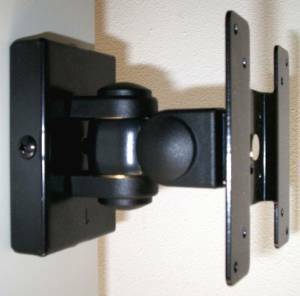 If a flush lcd wall mount is required, we recommend our D172A Flush Mount LCD Monitor Bracket. 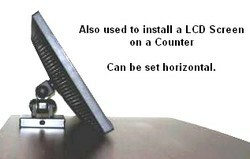 * How to mount the LCD? 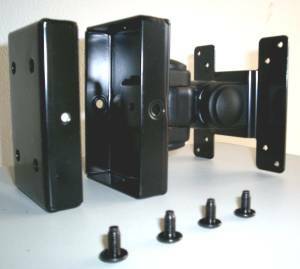 a) Attach the monitor to the VESA plate (right side of the picture); b) Affix the inner part of the base (left part shown above) to the wall with the hardware provided; c) Attach the other part of the base w/monitor to the wall-base with the 4 bolts shown above. This base is made of strong, 3mm. thick steel. 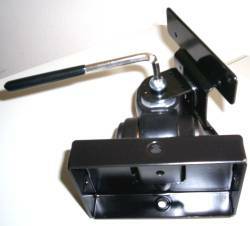 As shown above, the torque can be easily adjusted with the provided wrench, to achieve the desired ease of movement when arranging the viewing angle. 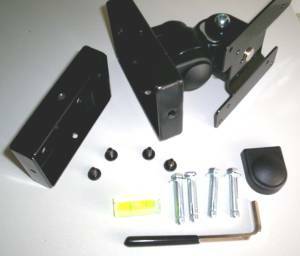 Simply remove the protective caps and adjust the torque bolts.Both articulations can be adjusted.